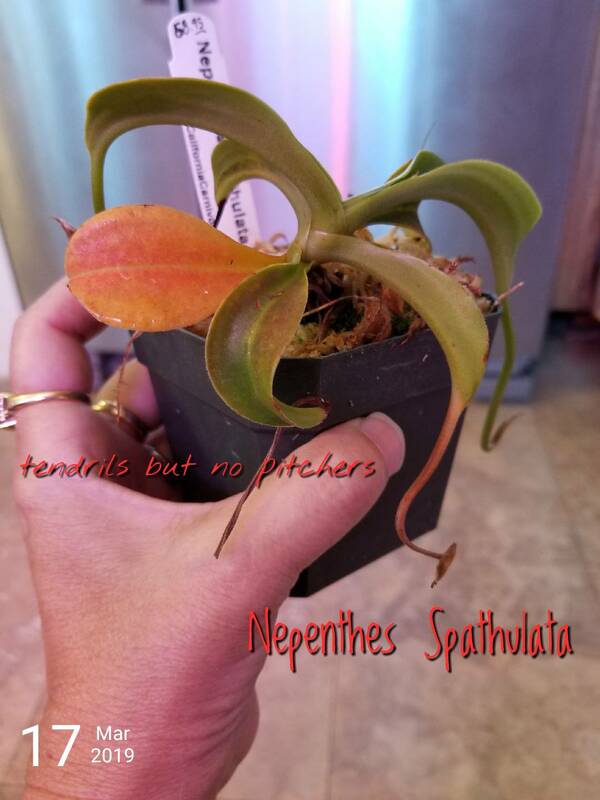 This Nepenthes Spathulata is a special plant as I purchased it with award regcognition money I received from work. It's the only one of my plants that's named which is Joey (don't ask). So I was sad when after arrival Joey promptly dropped both it's beautiful pitchers and refused to grow any new ones. It is perfectly normal for new plants to drop their pitchers and not make new ones for a while as they settle in and acclimate. Following that, the first thing to look at should always be lighting, as they need energy to pitcher and light is what provides this; most can take some direct sun, certainly plenty of diffused sun, if you let them get it. Most hybrids will pitcher just fine in relatively moderate humidity if allowed to acclimate so that is not generally the cause. Additionally, for any highlanders or highland hybrids increased heat will not increase pitchering, but perhaps put the plant at risk of stress; some are more tolerant than others but if these are hot lights I would be very careful around them. Good point. Yes, the lights are T5 LED Full Spectrum so they're not hot. 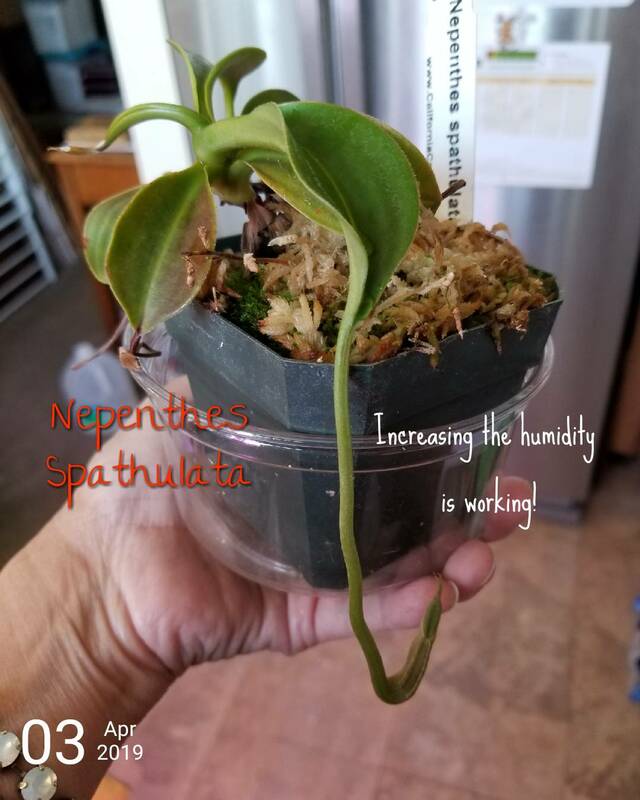 True, the N. Spathulata was not a fan of relocation. Does not help that it's quite dry here in So Cal (even with all our rain this Winter) I've never seen our indoor humidity over 54% (unless I'm running the dishwasher). Regarding the Truncata x Talangensis, from what I'm reading they're slow to pitch. I'm trying the increase in humidity trick and will see what happens. As far as temp goes, I tend to go by rule: if I'm comfortable in T shirt and PJ bottoms then my naked Nepenthes are prob ok. If I'm too cold or hot then I adjust. On average temps range low 60s to low 70s at night and low 70s to low 80s daytime dependent upon season. All that being said I am open to new suggestions or advice. The Truncata x Talangensis hybrids have stumped me a bit. Actual highland plants will need a bigger drop day to night than that to be happy; a talangensis hybrid, in particular (even though it's crossed with truncata) probably wants temperatures dropping, if starting out in low 70's to low 80's during the day, to the mid-50's at night. Your comfort is not really a good measure for what the plants want. A pure N. talangensis would also be one of the species that requires a fairly high humidity to pitcher well (80%), but a hybrid throws a lot of that out the window, and spathulata is also highly tolerant. Light and temperatures appropriate to the class of plant you have are going to be top of the list for things to consider, nearly always. The night time temps are a little lower than what I've read but will take it into consideration. I am always open to learning more about these plants. Not sure it'll get that cold at night as we're heading into warmer weather now. My lighting is LED so is not adding to heat. I have a thermometer that also monitors humidity so I have a good idea of conditions. It also gives averages which I like. It is really arid here <40% so will continue with increasing humidity for these three as long as they're showing progress. I'll just cut more holes and slowly adjust them back to room conditions. Part of the journey is learning...learning what works, problem solving, celebrating your little victories and learning from others with more experience with these beautiful plants, so thank you. Not sure what you read then; the vast majority of resources and growers will cite night temps in the mid 50's for highlanders at least. Ultra-highland plants (a pure talangensis, for example), may want even lower. Below 40% humidity is most days where I live as well; often if it gets above 15% it's getting humid. My plants are in a greenhouse now, but before I had it I had plants pitchering in household humidity around here after they acclimated. In my experience, having stable climate that the plants can acclimate to is usually enough for them to pitcher and grow decently. Certainly higher humidity and cooler nights would help the plant produce larger pitchers, however. plants for a simple terrarium? What plants for a simple terrarium?